I promised Jason Mercier on twitter that I'd write a blog to help explain why the ante structure in a tournament has a direct relation to the amount of play in an event. Contrary to popular belief, smaller antes do NOT give you more "play" they, in fact, hurt the amount of post flop play significantly, thus taking much of the skill component out of tournaments. M vs average big blinds. First it's important to explain the difference between M and avg bbs in terms of how it relates to your life expectancy in a tournament. M calculates the number of rounds you can last if you ante off. So for example, if the blinds were 400-800 with a 100 ante at a 9 handed table and you had 8400 in chips, your M would be 4. 2100 per round, giving you 4 rounds. In terms of big blinds, you'd have 10.5. Lower antes increase your M, which allows you to go into survival mode on a short stack for a longer period of time without feeling the pressure of going all in. Average big blinds per player in the tournament is what you'd look at to see how much "play" there is in a tournament. The higher the average big blinds per player is, the more streets will be bet, and the more maneuvering will occur post flop. A tournament that boasts a higher bb per player average is one that is clearly more skillful because more intricate decisions will be necessary. Deep stacked poker is just harder, plain and simple. That's not debatable. The problem with tournaments with tiny antes is that it allows short stacks to hang around longer without having to make a move. Great for short stacks, but much like the epidemic you see online of "short stacking," when too many players are hanging around with a short stack, the avg bb per player takes a major hit, and average to above average stacks are forced to tighten up significantly because behind them sits three stacks ranging from 8 to 15 big blinds. The bigger stacks are forced to open less. So why is this a bad thing then? 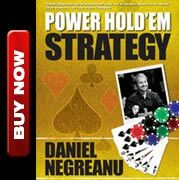 Well, while short stacks do get a bit more time to wait for a hand, it absolutely handcuffs the rest of the players at the table so what you end up having is a tournament overrun with short stacks and the tournament becomes a pre-flop shove fest. Average and big stacks are forced to play the same style as the short stacks because there are simply too many short stacks still in the tournament because the antes haven't pressured them to make a move. Say there is 10 million chips in play, the average stack would be 100,000 if 100 players remained. If there are 80 players remaining, the average stack would be 125,000. So if the blinds at that stage are 1000-2000, the average # of bbs would be 50 with 100 left, or 62.5 with 80 remaining. Essentially what this shows is that the tournament would have more play at this stage if less players were still in. Less Flops. With lower antes and more short stacks, you end up seeing less flops. The big blind gets a worse price to defend, and because the average stack is so much smaller, it doesn't allow players to call as many raises with bust em' type hands because their opponents simply aren't deep enough to make calling profitable with hands like 44 or 6s 7s. With less flops being seen, less players go broke. That's not a good thing at all. When two or more players see a flop the chances of someone going broke increases significantly. Higher Antes Give Incentive to Short Stacks to Shove. With higher antes, a stack of say, 10 big blinds has even more incentive to take risks and go all in. 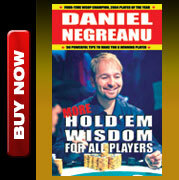 This helps eliminate short stacks at a quicker pace which will elevate the average # of big blinds per player average. As I already pointed out, when the avg bbs is higher, there is more "play" in the tournament. An extreme example. Have you ever played a no limit tournament with no antes? If so, what you'll find is that the game is WAY tighter and eventually there is little to no post flop play. Stealing blinds becomes less important, and shorter stacks don't get pressured to play any hands at all unless they pick up a monster. The more aggressive players are exploited if they play too many hands because A) they don't pick up any antes on their steals and B) they'll be in tough spots when they open for 2.5x and get shoved on by a stack that has a total of 9 bbs. Anytime a level or two guys by where very few players get busted, you just know that the structure is going to suffer in the later stages. Conversely, if there is a level where lots of players bust, the chips become concentrated amongst a smaller group of players who will now get to play deeper in the late stages, allowing skill to prevail. I think its important to note that my position on antes is in direct contrast with the structures we see on many of the PokerStars sponsored tours. The EPT and NAPT both go with lower antes at several key stages of their tournaments. I am a company man obviously, and that's why I thought it was important to point out that I've always been, and always will be a free thinker. When I say that I genuinely believe PokerStars is the best online poker company, and the best and safest place to play online poker, I genuinely believe that to be true. If I didn't, I can promise you I wouldn't say it. I don't always agree with every decision that is made, and I think it would be wrong of me to not point out errors where I see them. I blasted the Bellagio structures a year ago, so it's only fair that I also criticize the structures of the NAPT and EPT events. It's that last one, 4000-8000 with a 500 that I find the most disturbing. The standard ante should represent 25% of the small blind. If the chips don't divide like that, you should veer between 20% and 33%, but no less than 20%. In this case, you could choose to go with a standard 25% of small blind ante, but instead they use a 12.5% ante. I'd be happy to discuss this with anyone who disagrees with me and I'd be happy to hear their points in favor of smaller antes. As of yet, I have yet to hear a single argument as to why it's better to have a 200 ante at 1200-2400 than a 300 ante.